So, I started out making a potato sad that I intended to use rocket in, to use up some of the rocket I have, but then I got around to adding the rocket and changed my mind and added green beans instead. I am glad I did because the freezer was just starting to extract the liquid from the beans and would have soon dried them out. This is a pretty standard potato salad. I boiled 4 potatoes in salted water and hard-boiled 4 eggs. I use Martha Stewart’s method to boil eggs and it never fails me. I am not going to reinvent boiling eggs. When the potatoes were done I ran cold water on them to chill. I also chilled the eggs. I then boiled some salted water and blanched the green beans. I did not want them mushy and wanted them to stay bright. So then I chopped up one whole yellow onion, the potatoes, the eggs and the green beans and tossed them together. I drained a can of black olives and crushed about 1/3 of the can. In a bowl, I missed 3 TBSP mayo, 1 tsp of mustard, 3 TBSP of apple cider vinegar and a 1/2 tsp of sugar, salt and pepper. I made it to taste and added to the salad and blended. This made 4 to 6 servings and was better the next day. It’s nice and tangy with the mustard, the olives add an earthiness that I love. This was a fast, simple dinner that took very little time or effort. I sautéed two breakfast links in my cast iron pan. When they were half done, I added some chopped onion, green and yellow beans and put the lid on my pan, adding salt and pepper. While they cooked, i sliced the dried plums in strips. I added them when the beans were nearly tender and put the lid back on. When they veggies were tender, it was ready to serve. It’s a nice, hearty dinner with lots of umami and a bit of sweet surprise from the plums. Pork and dried fruit are always delicious together. Last month, my best friend and I stopped at Meat Cheese Bread for lunch and we each ordered a sandwich and then shared half of our sandwiches with each other. She had a pulled pork sandwich and I ordered a green bean sandwich, mainly out of curiosity. I mean, it sounded good, but I still wondered how green beans would fare as the star in a sandwich. Extremely well. As good as her pulled pork sandwich was, it was still just a pulled pork sandwich. On the other hand, the green bean sandwich was a revelation. My budget does not run to dining out more than a few times a year, so if I wanted to have this delicious sandwich again, I would have to learn to make it myself. The first thing was learning to make bacon jam or relish. I read a dozen or more recipes, decided that I was not going to splurge on bourbon or maple syrup in order to save on sandwiches and came up with my own recipe without those ingredients. It may not be an exact replica, but it is delicious and it works. I could possibly add a bit more vinegar and be a little closer to the Meat Cheese Bread bacon relish since their version is not quite so thick. I am not too worried, though, because this sandwich turned out amazing and everything I hoped it would be. I also made up some aioli in advance. I cheated and made it with mayonnaise. I peeled 6 cloves of garlic and smashed them with the side of a knife. I sprinkled salt on them and let them rest for five minutes, coming back to mince them into small pieces. I stirred the garlic into 1 cup of mayonnaise and added the the juice of half of a fresh lemon squeezed. I mixed it all together, added 2 tsps of olive oil and stirred it in and put it away in a plastic container with a good lid. It will keep just as well as plain mayonnaise and will be a good spread of sandwiches or tasty added to some potatoes. There were no ciabatta rolls when I went to the grocery store, so I bought some large hard rolls instead. This sandwich requires a roll with substance, one that will hold up and not get soggy when the egg yolk runs into it. The rolls I used are WinCo’s specialty and very affordable at 19 cents each. Finally read to make sandwiches, I started by button a pot of water on the stove to boil, I filled it quite deeply with water because it needed to cover the eggs when I boiled them. While the water was heating up, I turned the broiler on the oven. I snapped the vine end off 12 green beans and sliced a roll in half. I placed the halves of the roll on the top rack in the oven facing up toward the broiler coils. 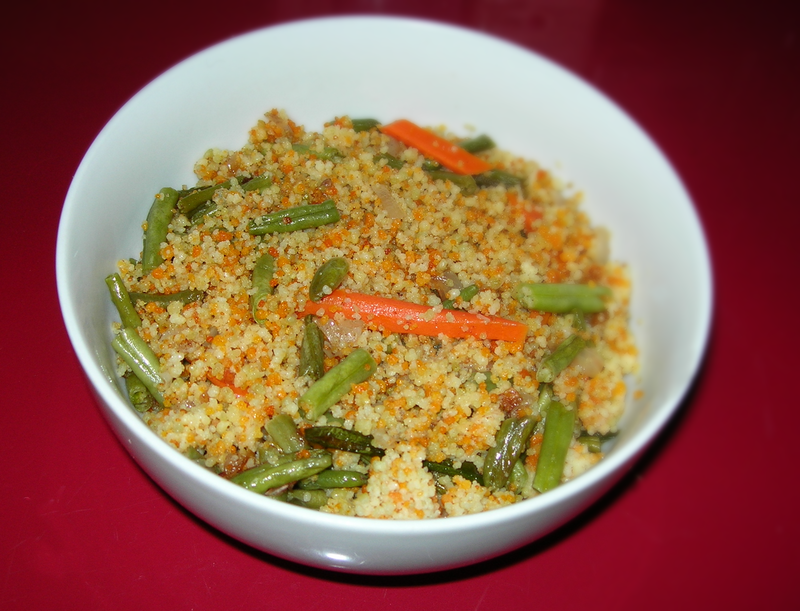 One thing I thought I could improve on was the texture of the green beans. I thought they were just a bit too crisp and not quite done. I wanted crisp and crunchy but I wanted the flavor to taste done, not raw. To do that, I decided to blanch the green beans first. To save on pots and pans and time, I blanched them in the water for the soft-boiled eggs. I dropped the green beans in the boiling water and counted out 60 seconds. I could have watched the clock, but 60 seconds is just long enough to get distracted and overcook the green beans. I didn’t want them cooked, just heated through so they lost their rawness. I pulled them out with tongs and set them aside and put 2 eggs in the boiling water, checking the clock. They needed to boil exactly five minutes for a perfect soft boil. While they were boiling, I removed the now perfectly toasted buns from the oven and put them on a plate. I spread some aioli and bacon jam on one side and shaved off a few slices of parmesan. After five minutes, I removed the pot of water from the burner and poured out the water, running cold water in the pot to cool the eggs so I could peel them. Meanwhile, I did not turn off the burner, instead I turned my stovetop fan up on high and used my electric coils to “grill” the green beans. I placed them directly on the coils and used my tongs to turn them and remove them once they had a nice char. This worked very well and the beans were nice and crispy but not the least bit raw. I placed them on the other half of the roll, laying down a bed of green beans. Then I peeled and sliced the soft-boiled eggs. They were perfect which meant the yolks were a bit runny which meant it was messy but that’s okay. I don’t know how you neatly slice soft-boiled eggs. Using the side of the knife, I picked them off the cutting board and placed them on top of the green beans. I put a few shavings of parmesan on top and added just a bit of salt and pepper to the eggs. They are photographed open, but I put the two halves together and pushed down just a bit. The yolk kind of held everything together and the flavors blended perfectly. 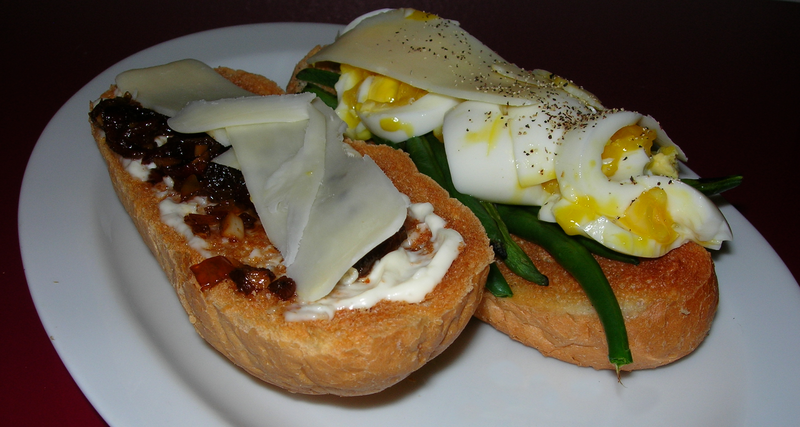 There was the sweet and savory vinegary bacon jam, the creamy garlicky aioli, the fresh crispy green beans and the creamy, lush soft-boiled eggs with just a hint of the nutty parmesan all with a good, solid bread to absorb everything and hold it all together. It was not identical to the restaurant sandwich, but the minor differences made it even better. I seldom roast chicken because I love soup and hate losing all the broth I can get from boiling a chicken for soup. However, I got this brainstorm the other day, wondering what would happen if I saved all the bones from my roast chicken and boiled them for broth. I tried it and it worked. Now, the broth was not a rich in chicken flavor as one that has had the skin and meat cooking away with the bones, but it was flavorful and delicious anyway. To start, I sautéd an onion in 1/2 tbsp of olive oil. I added 2 cloves of garlic, salt, pepper and 1 tsp of dry mustard. Then I tossed in the carcass and all the remains from the roast chicken. I added water enough to cover the bones, put a lid on and brought it to a simmer. I added a bay leaf and let it simmer away for about an hour. I strained the broth to be sure I got all the bits of bone and cartilage out and tossed them away. 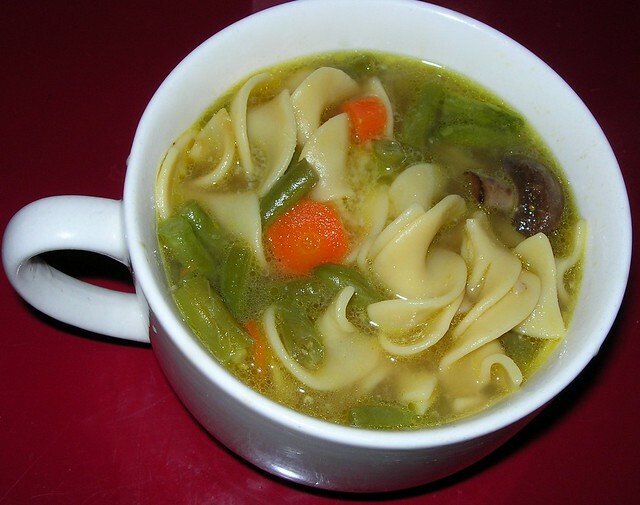 Now I was left with a tasty broth. I added 2 carrots and 8 mushrooms, in 1/2 pieces or so, and let them cook until tender. 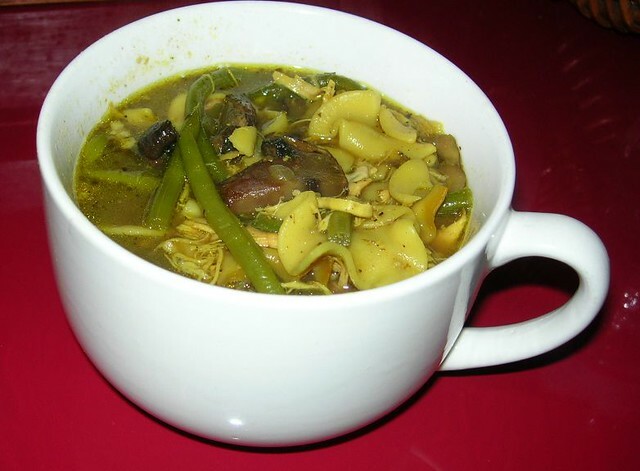 I then added 1 cup of frozen green beans and 1 cup of dry packaged egg noodles. The noodles took about 10 minutes to cook until tender and by then everything was done. I added some salt and pepper and 1/2 tsp of mustard to boost the flavor a bit. Grab your stock pot and put 1 TBSP of olive oil on the bottom and put on medium heat. Add one onion, chopped, and 3 cloves of garlic, minced. Let cook until tender, toss in 1 cardamom pod, crushed and chopped fine. Toast in the oil before adding a small lamb shank (about 1 pound). Brown the lamb shank on each side and then add 2 quarts of water, 2 small cans of chopped tomatoes (or 3 fresh tomatoes) and cover and bring to a boil. Toss in 2 bay leaves and reduce to a simmer and allow to simmer for an hour or more until lamb falls off the bone. Meanwhile, chop up 1 pound of potatoes into 1 inch cubes and snap 1 pound of fresh green beans. When the lamb is tender, remove from the pot and let cool. Add the potatoes and green beans and allow that to cook while you remove the lamb from the bone and cut into 1 inch pieces for the stew. Add the meat back in along with 1/2 of freshly grated nutmeg and 1 TBSP of turmeric. 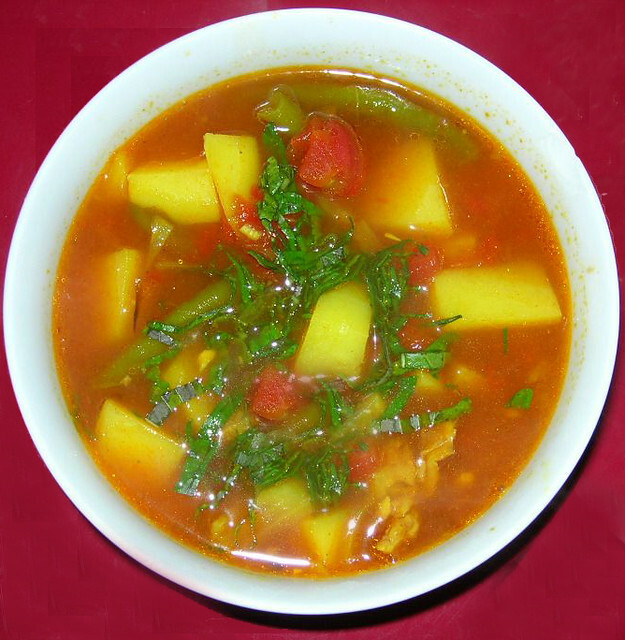 This is a very aromatic stew, with a savory blend of meat and potatoes set off by the sweetness of tomatoes and the bright heat of cardamom and nutmeg all held together with the deep flavor of turmeric. You can take fresh basil leaves and roll them into a cigar and chiffonade the basil to sprinkle on top of the stew when you serve. That’s completely optional. You can also add a dollop of sour cream if you like. This makes 8 to 10 servings so you will have to store in the fridge for later meals. Chop 1/4 of a small yellow onion and mince one clove of garlic. Heat 1 TBSP of olive oil in a saute pan and add the onion and garlic. While that cooks, chop up 2 red peppers into inch long pieces. Add to the onions and garlic when they are tender. Add salt and pepper. Add 3 TBSP of barbecue sauce and 1 TBSP of mustard. 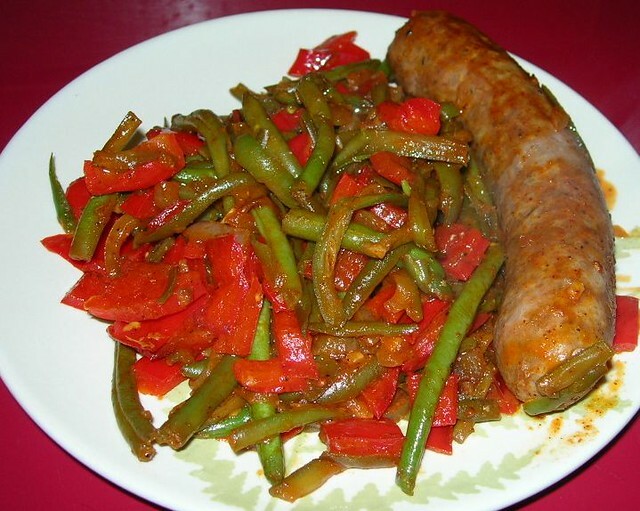 Toss in bratwurst and let cook for a while until bratwurst is done and peppers are tender. 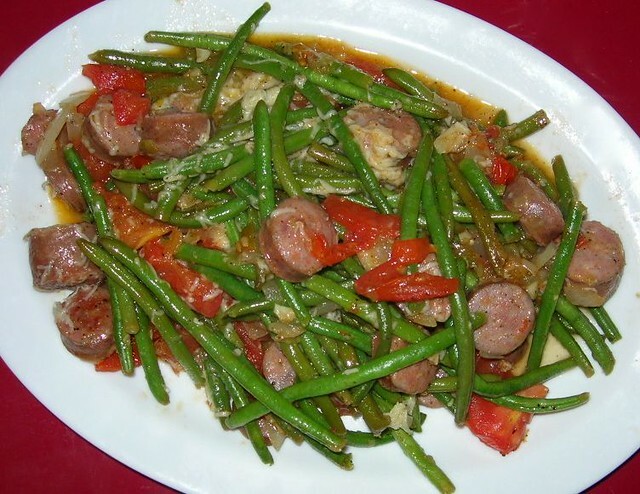 Add a few handfuls of frozen or fresh green beans, 1/2 cup of water, stir and let cook until tender.